Key Message: The role of botulinum toxin in the amelioration of a variety of symptoms associated with movement disorders like hemifacial spasm, focal dystonias like blepharospasm, cervical dystonia, oromandibular dystonia, limb dystonias, tremors, tics and Parkinson′s disease is discussed. The method of administering the injection at various sites and the side effects produced have also been presented. Botulinum toxin is produced by an anaerobic bacterium named “Clostridium bacillus”. It is an exotoxin having eight serotypes named A to H. The types A and B were first designated by Georgenia Burke in 1919 and are the only ones approved by the United States Food and Drug Administration (FDA) currently for therapeutic use. Bengston and Seddon first described the type C toxin in 1922; and later in 1928, Meyer and Gunnison described the type D and E varieties., The type F and G botulinum toxin were introduced by Moller and Scheibein in 1960 and Gimenex and Ciccarelli in 1970. The type H is the deadliest toxin available, that was discovered by Stephen Arnon in 2009. The type A was initially called Oculinum and later renamed by Allergan Pharmaceuticals in 1991 as 'Botox' (OnabotulinumtoxinA). Another type A toxin named 'Dysport' (AbobotulinumtoxinA) was marketed world-wide by Ipsen Pharmaceuticals in 1991. 'Xeomin' (IncobotulinumtoxinA) was introduced by Merz Pharmaceuticals; with 'Hengli' (Lanzhou Institute of Biological Products Co., Ltd; Lanzhou, Gansu) and 'Neuronox' (Medytox Inc., South Korea) being the other subtypes available in South Asian countries. Neurobloc/Myobloc (RimabotulinumtoxinB) came into existence in 2000 by Elan Pharmaceuticals as type B toxin. The toxin complex consists of botulinum neurotoxin, non-toxin proteins and excipients. The neurotoxin is a dipeptide molecule weighing 150 kDa, having a heavy and a light chain attached by a disulphide bond. The other non-toxin proteins weigh from 500 to 900 kDa and prevent absorption through the skin. The excipients consist of lactose, sucrose, and albumin, which determine the pH of the drug and help in stabilisation of the compound. RimabotulinumtoxinB has a pH of 5.4, which makes it painful to inject as compared to the type A toxin, which has a pH of 7.4. IncobotulinumtoxinA is the only variety of the toxin which can be preserved at room temperature, whereas others require refrigeration. RimabotulinumtoxinB is available as a ready-to-use solution, whereas others are freeze dried powders, which require reconstitution with 0.9% normal saline. After reconstitution, the manufactures recommend usage of the compound within four hours, but the reconstituted product can be preserved for a week in the refrigerator. After injection into a site, the tissue proteases cleave the drug molecule [Figure 2]. The heavy chain helps to bind the toxin to surface glycoproteins at the cholinergic nerve terminal, and thus, it gets internalised at the neuromuscular junction. The toxin inhibits the release of acetylcholine at the neuromuscular junction thereby leading to an efficacious decrement in the neuromuscular transmission at these junctions but not leading to clinically significant weakness. Not only does it influence the alpha motor neurons, it also influences the gamma motor neurons leading to reduced spindle afferent activity. This causes the muscle to be relaxed and reduces its spasm without weakening the muscle. There is also retrograde transportation of the toxin into the axons and the spinal cord thereby preventing the Renshaw cell inhibition and reciprocal inhibition as well. The toxin is also believed to play a role in modulating the brain plasticity. The brain tends to reduce the size of cortical representation of a particular area that is not in use. Thus, by decreasing the spindle afferent activity, botulinum toxin signals the brain about reduced activity of that area, leading to further decrease in its representational size and thereby causing decreased movement. Secondly, it also decreases the cortical GABAergic levels, thereby reducing the intra-cortical inhibition seen in patients with dystonia. The potency of the different types varies, with type A being three times more potent than type B. The effect of the toxin starts 2 to 3 days following the injection, peaks by 2 weeks and wanes off by 2.8 months. The immunogenicity of Type B is higher; the intramuscular injections are more painful with a greater effect on the autonomic nervous system; they are mainly used in treating conditions like sialorrhea, hyperhidrosis and non-motor symptoms. A meticulous planning before the injection is very important to calculate the toxin dosages for the individual muscles likely to be injected. A written informed consent from the patient is a must before giving the injections. It is advisable to video tape the movements for future reference, and use them as a baseline for comparison to assess for any improvement or side effects. Having a detailed knowledge about the toxin and its dilution rate is of utmost importance, as it will remarkably influence the results in the patients. The dilution rates in blepharospasm patients varies from 1.25units (U)/0.1 ml to 5 U/0.1 ml for onabotulinumtoxinA and incobotulinumtoxinA, whereas it varies from 10 U/0.1 ml to 20 U/0.1 ml for abobotulinumtoxinA. The recommended dilutions of onabotulinumtoxinA/incobotulinumtoxinA for cervical dystonia patients varies from 50 U/1 ml to 200 U/4 mL with normal saline. This dosage is also dependent on the volume and number of injection sites desired to achieve the treatment objectives. In general, not more than 50 Units per site and 400 U maximum per sitting, should be administered. A sterile needle of an appropriate length (e.g., 27-32 gauge for blepharospasm and 22-24 gauge for cervical dystonia) should be used. Localization of the involved muscles with electromyographic (EMG) guidance may be useful, but EMG can only reveal if the muscles are hyperactive or not. Bhidayasiri et al., in 2006 stated that the outcome following EMG guided injections were comparable to the manual injections following palpation of muscles. Ultrasound is a new way to localise the muscles to be injected. Various studies have shown the superiority of ultrasound over clinical palpation of muscles.,,,,,, Further injections are guided by the response of the patient to prior injections and the side effects. Higher doses are required if the patient has less than 50 to 60% improvement from the previous injection. The toxin is contraindicated in pregnancy and during breast-feeding. Botulinum toxin injections are generally safe and effective with very few side effects. It is important to note any prior history of bleeding diathesis or a history of blood thinning medications being administered; as the toxin is given intramuscularly, the presence of these conditions can lead to haematoma formation. The toxin can spread to nearby tissues when injected in large doses, rarely leading to weakness of muscles. Also, rare systemic side effects of the toxin that are reported include influenza-like illness, necrotising fasciitis, gall bladder dysfunction, brachial plexopathy and generalised muscular weakness. A subset of patients can develop antibodies against the toxin making them non-responders. Hemi-facial spasm (HFS) is characterized by dyskinesia of the facial muscles involving involuntary irregular tonic or clonic twitching of periocular and periorbital muscles innervated by the seventh cranial nerve. Most of the cases are unilateral with only 0.6 to 5% reported incidence in literature of bilateral cases. Yoshimura et al., in 1992, were the first to use botulinum toxin in patients with hemi-facial spasm. The muscles implicated in hemi-facial spasm include the orbicularis oculi, zygomaticus major and minor, risorius, levator labii superiosis, orbicularis oris, mentalis, depressor angularis and platysma; however, the muscle to be injected is based on the physician's observation of the involvement of muscles. The starting doses are 2.5 to 5 U per site for onabotulinumtoxinA/incobotulinumtoxinA, and 15 to 20 U per site for abobotulinumtoxinA. One of the studies reported an overall 80% improvement in patients of hemi-facial spasm injected with botulinum toxin and found no difference in the efficacy of onabotulinumtoxinA and abobotulinumtoxinA. They also reported improvement in symptoms by the second to the fourteenth day after the injection was administered. A study in 2010 showed that botulinum toxin not only improved the motor symptoms in patients with hemi-facial spasm but also markedly reduced the non-motor (tearing, eye irritation, facial paraesthesias and clicking sound in the ear) symptoms in these patients by nearly 75% following the administration of the first injection itself. Another study showed that botulinum toxin type A was effective in improving facial asymmetry present at rest, but worsened the facial symmetry during voluntary movements. The effect of splitting the injection sites into two at the zygomaticus and risorius muscles proved to be equal to administering a non-split injection. The side effects ranged from 3 to 25% and included ptosis, lagophthalmos, dry eye, entropion, local site bruising, tearing, keratitis and diplopia. These effects were transient and usually reversible. Cervical dystonia is the most common of the focal dystonias and clinically characterized by involuntary contractions of cervical muscles causing abnormal head movements and postures. The current classification of cervical dystonia includes torticollis (rotation or turning of head towards one side), anterocollis (flexion of head and neck), laterocollis (head tilting towards one side), and retrocollis (extension of head and neck). A combination of these movements is commonly seen in clinical practice. Recently, combinations of complex cervical dystonias have been classified depending on the neck (collis) and head (caput) movements. Besides these, there may be lateral or sagittal (anterior or posterior) deviation of the base of the neck from the midline. The patients with an anterior sagittal shift characteristically have anterocollis and retrocaput causing a gooseneck posturing, whereas those with a posterior sagittal shift have a double chin appearance secondary to retrocollis and anterocaput. Although cervical dystonia is the most common variety of the focal dystonias, not many physicians are trained in treating the same. A lot of factors need to be considered while injecting the toxin in patients with cervical dystonia. Tsui et al., in 1985 were the first to demonstrate the efficacy of type A botulinum toxin in cervical dystonia patients, whereas in 1997, Lewy et al., showed that type B toxin is also efficacious. Type A and B botulinum toxins have both been approved for treatment of cervical dystonia, and it was seen in studies that there was no significant difference between their efficacies. In a study by Zoons et al., 43 to 68% of the patients with cervical dystonia injected with botulinum toxin reported a beneficial effect. They used Tsui and Toronto Western Spasmodic Torticollis Rating Scale (TWSTRS) to record improvement in symptoms. The side effects included focal weakness of the neck muscles and dysphagia, which could be reduced by avoiding injection into the lower part of the sternocleidomastoid (SCM) muscle. The incidence of dysphagia ranged from 10 to 12% and was seen particularly when bilateral SCMs were injected in cases of antecollis and also when higher doses of the toxin were used for cervical dystonia., Despite botulinum toxin being the first line therapy for cervical dystonia, it was found that around 30% of the patients discontinued therapy in various longitudinal studies. The review by Jinnah et al., reported that the physician-estimated benefit was higher than patient-estimated benefit. They also stated that the lack of benefit was usually due to an improper dosage schedule and muscle selection rather than due to actual lack of efficacy of botulinum toxin. The group of patients who responded less to the treatment included those with antecollis, anterior or posterior sagittal shift, or tremor associated cervical dystonia. A previous surgery for cervical dystonia, the use of neuropleptics, and the requirement of higher doses of the toxin was also associated with a poorer response. Oromandibular dystonia (OMD) is a type of cranial dystonia characterized by forceful contractions of the face, jaw and/or tongue, causing a difficulty in jaw opening (jaw opening dystonia) or closing the mouth (jaw closure dystonia) affecting chewing and speech. A patient may have a combination of blepharospasm and OMD, also known as Meige's syndrome.,, The manifestations may be primary, secondary to other neurological disorders, or tardive in nature (drug induced). The upper facial muscles are usually involved at the start of the symptoms, followed by the lower facial muscles. The contractions of facial and pharyngeal muscles can lead to abnormal vocalisation, which can be confused with tics. Tongue involvement in these patients is a pointer to the dystonia being drug induced. Jaw opening dystonia, also called as hyoid muscle dystonia, is more difficult to treat as compared to jaw closure dystonia. In the latter condition, nearly two-third of the patients respond well to botulinum toxin. The muscles implicated in jaw opening dystonia are the lateral pterygoids, anterior belly of the digastric, the submentalis complex (anterior and posterior digastric and the mylohyoid, geniohyoid, thyrohyoid, sternohyoid and omohyoid muscles) and platsyma, whereas the masseter, temporalis and medial pterygoids are involved in jaw closure dystonia. These are difficult to treat with oral medications, including tetrabenazine, which showed only a 17.4% improvement in the patient symptoms., There are studies showing that both botulinum toxin A and B are equally effective in oromandibular dystonias.,,,,,,,, The problems faced are that the muscles to be injected are close to vessels and nerves so theoretically EMG or USG guided injections are preferred. But studies have shown no difference in the incidence of of adverse effects utilizing the two procedures.,, The injection also helps in relieving the pain associated with temporo-mandibular joint involvement. Injections into the sub-mentalis muscle complex, though difficult to perform, can yield good results in the case of jaw opening dystonia. Oromandibular dystonia has been associated with social embarrassment for the patients as it may cause biting of the lips, tongue, and cheek as well as dental problems. Therefore, botulinum toxin injection may be very rewarding in them. The reported side effects after the injection include dysphagia, dysarthria, and neck swelling. In a study by Jankovic et al., these side effects accounted for 11.1% of all treatment visits. There are studies which do not recommend the use of botulinum toxin in lingual dystonia due to the fear of developing dysphagia, but the number of patients included in these studies have been too small to unequivocally make this recommendation., The muscle predominantly injected in the presence of lingual dystonia in a patient is the genioglossus muscle. In a study published in 2008 that included patients with tardive dyskinesia, 50 U of abobotulinumtoxinA was injected in each genioglossus muscle and a dramatic response was obtained. A task specific dystonia is a type of focal dystonia, which occurs only during performance of a specific skilled motor task. Writer's cramp is the most common type of task specific dystonia involving the hand. The earliest descriptions of writer's cramp came in the 1600s, but Sheehy and Marsden coined the term in 1982. Other types of focal task specific dystonias affecting the upper limb include the typist's dystonia, musician's dystonia, telegraphist's dystonia, hairdresser's dystonia, golfer's dystonia, surgeon's dystonia, and tailor's dystonia. Most of these dystonias are associated with activities involving the occupation of a person. Their presence can, therefore, be a huge source of disability for them. That is the reason that an early recognition and an accurate treatment of these movement disorders can be very rewarding in these patients. Oral agents hardly produce any benefit in symptoms and their use is declining. Cohen and colleagues in 1992 first demonstrated the efficacy of botulinum toxin in patients with writer's cramp. Since then, it has become the first line therapy, producing benefit in a significant number of treated patients. In a study published from India, 16 patients with writer's cramp were treated with botulinum toxin and the benefit was seen in 50% of the patients related to the pain they were having, as well as abnormal posturing and the ease and speed of writing. In a study by Kruisdjik et al., in 2007, 70% of the patients reported a benefit and wished to continue treatment using botulinum toxin, of which 51% continued to benefit from the treatment administered, even at one year duration. Karp et al., in a study of 53 patients, found the benefit lasting for up to 9 months. When injecting these patients, it is important to first determine the type of writer's cramp. This can be done by the use of mirror movements; an EMG guidance also helps in assessing the hyperactive muscles. These patients tend to adapt compensatory postures to overcome their disability so one may wrongly classify the type of dystonia and the involved muscles. Care must be taken to correctly document the primary abnormality. How much to inject and where to inject is the critical factor in getting a good response; also, there is the constant risk of causing spread of the toxin to the adjacent muscles, resulting in post-injection weakness of that part of the body. Wissel et al., found that 27 out of 31 patients with writer's cramp, when treated with botulinum toxin, developed weakness at least once in the course of the period during which they were receiving these injections. The extensor groups of muscles required lesser doses as compared to the flexor muscles. 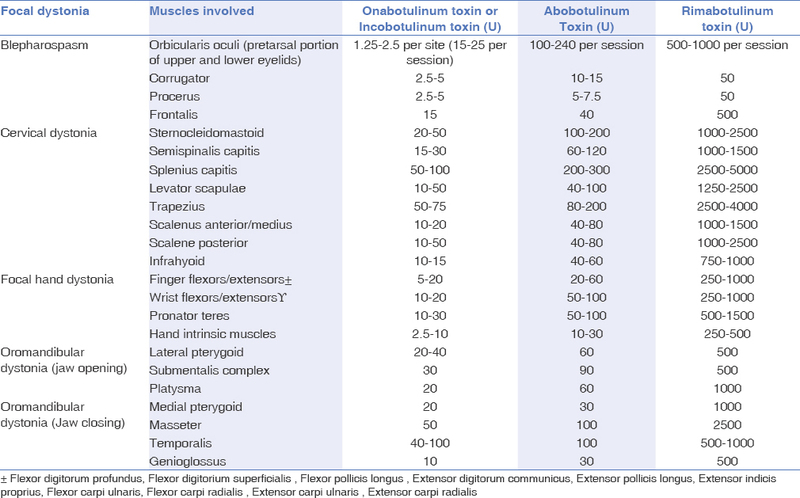 The starting doses for each muscle needed to be conservative, ranging from 2.5 to 10 U of onabotulinumtoxinA and incobotulinumtoxin A, and 40 to 60 U of abobotulinumtoxinA. The maximum doses administered were 120 U for onabotulinumtoxinA and incobotulinumtoxinA, and 240 U for abobotulinumtoxinA. Injecting the muscles closer to the endplates and selecting fewer muscles provided better results. Tremor is defined as a rhythmic, involuntary oscillation of a body part around one or more of the joints. Tremors may be classified based on the clinical features, the etiology or the origin of the tremor. Essential tremor, Parkinsonian tremor, cerebellar tremor, dystonic tremor, orthostatic tremor, physiologic tremor, and psychogenic tremor are the most common types of tremors encountered in a movement disorder clinic. Tremor is mainly managed by giving oral medications, and botulinum toxin is a good therapeutic option in refractory patients. In a study by Jankovic et al., 51 patients with tremor (42 with head tremor and 10 with hand tremor; 14 with dystonic tremor, 12 with essential tremor, 22 with a combination of dystonic and essential tremor, and one each with parkinsonian, peripherally induced, and midbrain tremor) were injected with onabotulinumtoxinA, of which 67% had improvement. However, 29% of the patients with head tremor developed dysphagia, 10% had transient neck weakness, and 5% had pain, whereas 60% of the patients with hand tremor developed transient hand weakness. In another study by Henderson et al., 10 out of the 17 non-dystonic tremor patients showed improvement in postural and kinetic tremor. Rezvan et al., used incabotulinumtoxinA in 19 patients with essential tremor in a placebo controlled crossover blinded study and reported improvement in tremor in 63% of the patients. Overall, 53% of the patients were satisfied with the treatment with only one patient developing hand weakness. Rahimi et al., used kinematic measurements to measure the tremor amplitude in 24 Parkinson's disease (PD) patients, and found that injection botulinum toxin improved their tremors. In another study, Trosch et al., reported more subjective benefit rather than objective changes in 26 patients (12 patients with PD and 14 with essential tremor) injected with botulinum toxin. In a double-blind placebo controlled crossover trial at the Mayo clinic, 30 patients with PD were injected with incabotulinumtoxinA in a customised way and there was a statistically significant improvement in the tremor rating and patient perception of the improvement, with low occurrence of significant hand weakness. Apart from head and hand tremors, botulinum toxin has also been used in voice tremor.,,, A study by Charles et al., documented benefit in all the 13 patients having voice tremor treated with type A toxin. The side effects included dysphagia and breathlessness, which were maximum at week 2 with improvement by week 6 in all but one patient. Camptocormia is defined as an axial deformity, comprising 45 degree of forward flexion, which reverses on sitting, lying down, walking with support and standing against a wall. In patients with PD, camptocormia has been reported in 4.1 to 17.8% patients. It is postulated to be either a form of focal dystonia affecting the paraspinal musces; or, a paraspinal myopathy considered secondary to the disease pathophysiology and sometimes also secondary to dopaminergic drugs used to treat the disease. Thus, botulinum toxin injections in the paraspinal muscles can probably help to alleviate these symptoms. Studies related to this use of the toxin are too few and have recruited less patients to provide any conclusive evidence related to this stated benefit of the toxin. The muscles usually injected are the rectus abdominis, iliopsoas, and external and internal obliques. Only one study by Jankovic et al., has shown improvement in 50% of the patients treated with abobotulinumtoxinA (150-400 U per site injection), whereas studies by Van Coelln et al., Colosimo et al., and Fietzek et al., did not show any significant improvement in symptoms.,,, In another study, Naumann and colleagues injected botulinum toxin into the paraspinal muscles between the lumbar L2 to L5 levels in 6 patients with PD and reported a good response to the toxin given. Marvulli et al., injected incobotulinumtoxinA (100 U) in the paraspinal muscles of 10 PD patients with Pisa syndrome and found it to be effective with improvement evident on the goniometric grading and the visual analogue scale (VAS) score. The injected muscles were the paraspinal muscles, quadratus lumborum and abdominal obliques. The injection was administered about 2 to 2.5 cm lateral to the midline between the T10 to L3 level. Freezing of gait is described as interruptions in the gait occurring secondary to lower limb dystonia and its prevalence in PD ranges from 20 to 60%. It is usually seen to occur in the OFF periods and responds well to increasing the dose of levodopa, but the ON period dystonias and freezing of gait are usually resistant to dopaminergic drugs. Botulinum toxin is an alternative that can be used in these patients, but studies have not shown a consistent benefit. In one study, Wieler and colleagues used type A botulinum toxin in 12 PD patients with none showing improvement in their freezing of gait; however, their leg dystonia improved. They were injected at six sites in the gastrocnemius and soleus muscles with 200 to 300 U of onabotulinumtoxinA. There were no prolonged adverse events, but one of them reported that his legs felt like jelly one week post injection. Fernandez et al., used type B botulinum toxin to treat freezing of gait in patients with PD. Only one patient showed some improvement out of the 9 patients participating in the study. Another study by Giladi et al., reported marked improvement in 40% of the patients with PD manifesting with freezing of gait after being injected with type A botulinum toxin. On the contrary, Gurevich et al., did not demonstrate any improvement with type A botulinum toxin in freezing of gait. The role of botulinum toxin was examined in small cohorts of tremor-predominant PD patients. There was a modest but non-significant improvement in these patients but the side effects of finger muscle weakness dampened the enthusiasm to popularise the use of toxin.,,, Based on these small number of studies, it is difficult to draw a conclusion about the efficacy of botulinum toxin in the treatment of PD patients with focal arm tremor. Jaw tremor in PD patients causes embarrassment and may not respond to the conventional treatment. In a pilot study, botulinum toxin injection into each masseter muscle effectively improved the jaw tremor. Pain is also an under-recognised non-motor symptom amounting to disability in about 40% patients suffering from PD. In a study by Bruno et al., onabotulinumtoxinA was effective in alleviating pain in these patients. Injection botulinum toxin has level C recommendation for use in patients with tics. There is only one randomized controlled study by Marras et al., which has been shown to reduce motor tics in terms of the number and severity of tics, as well as the premonitory urge, with the use of botulinum toxin injections. In 2000, Kwak and his colleagues published a study, which included 35 patients suffering from Tourette's syndrome [TS] (30 male and 5 female patients). 29 of them experienced improvement in their tics following botulinum toxin injection and 23 had marked relief in their premonitory urge. Injection botulinum toxin has also been used in patients with vocal tics. In 2004, Porta and colleagues assessed the effect of onabotulinumtoxinA in 30 patients with TS. The vocal tics improved in 93% of these patients and the mean duration of response was for 102 days. Based on the current evidence, injection botulinum toxin may be helpful in treating focal motor tics and the effect is more rewarding in patients having dystonic tics. Botulinum toxin injection is an effective modality of treatment for treating patients with movement disorders. Although considered safe, there are still many limitations, such as a short duration of response and a high cost. Movement disorder neurologists should try to optimize the benefits and reduce the risk of adverse effects that are observed at each treatment visit. The efficacy of botulinum toxin treatment depends upon the appropriate dosage administered, the proper selection and identification of muscles; and, realistic expectations from the patients. Panicker JN, Muthane UB. Botulinum toxins: Pharmacology and its current therapeutic evidence for use. Neurol India 2003;51:455-60. Erbguth FJ, Naumann M. Historical aspects of botulinum toxin: Justinus Kerner (1786-1862) and the “sausage poison.” Neurology 1999;53:1850-3. Devriese PP. On the discovery of Clostridium botulinum. J Hist Neurosci 1999;8:43-50. Scott AB. Botulinum toxin injection into extraocular muscles as an alternative to strabismus surgery. Ophthalmology 1980;87:1044-9. Jabbari B. 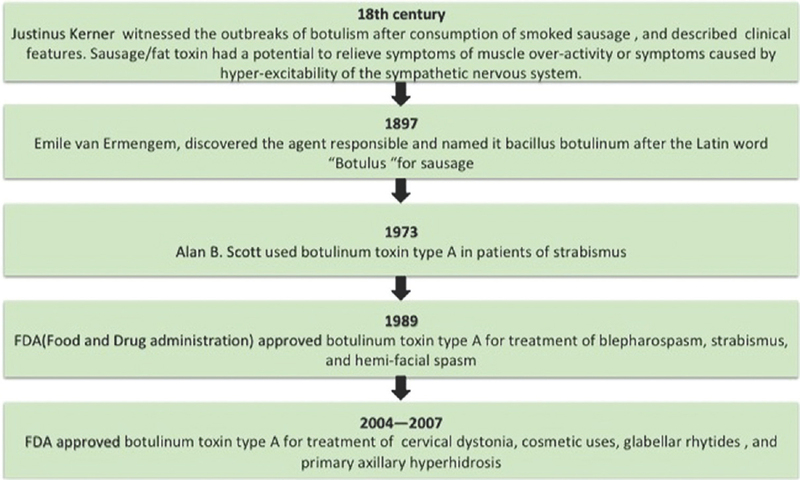 History of botulinum toxin treatment in movement disorders. Tremor Hyperkinetic Mov N Y N 2016;6:394. Lim ECH, Seet RCS. Use of botulinum toxin in the neurology clinic. Nat Rev Neurol 2010;6:624-36. Thenganatt MA, Fahn S. Botulinum toxin for the treatment of movement disorders. Curr Neurol Neurosci Rep 2012;12:399-409. Burke GS. The occurrence of bacillus botulinus in nature. J Bacteriol 1919;4:541-53. Truong D, Dressler D, Hallet M, Zachary C. Manual of Botulinum Toxin Therapy. Cambridge, UK, Cambride University Press, 2nd Edition. 2013. Scaglione F. Conversion ratio between Botox®, Dysport®, and Xeomin® in clinical practice. Toxins (Basel). 2016;8 (3). pii: E65. doi: 10.3390/toxins8030065. Dressler D. Clinical applications of botulinum toxin. Curr Opin Microbiol 2012;15:325-36. Lim EC-H, Seet RCS. Botulinum toxin: Description of injection techniques and examination of controversies surrounding toxin diffusion. Acta Neurol Scand 2008;117:73-84. Hallett M. Mechanism of action of botulinum neurotoxin: Unexpected consequences. Toxicon. 2017 Aug 11. DOI: 10.1016/j.toxicon. 2017.08.011. Bentivoglio AR, Del Grande A, Petracca M, Ialongo T, Ricciardi L. Clinical differences between botulinum neurotoxin type A and B. Toxicon Off J Int Soc Toxinology. 2015;107:77-84. Bhidayasiri R, Cardoso F, Truong DD. Botulinum toxin in blepharospasm and oromandibular dystonia: Comparing different botulinum toxin preparations. Eur J Neurol 2006;13:21-9. Walter U, Dressler D. Ultrasound-guided botulinum toxin injections in neurology: Technique, indications and future perspectives. Expert Rev Neurother 2014;14:923-36. Von Coelln R, Raible A, Gasser T, Asmus F. Ultrasound-guided injection of the iliopsoas muscle with botulinum toxin in camptocormia. Mov Disord. 2008;23:889-92. Santamato A, Micello MF, Panza F, Fortunato F, Baricich A, Cisari C, et al. Can botulinum toxin type A injection technique influence the clinical outcome of patients with post-stroke upper limb spasticity? A randomized controlled trial comparing manual needle placement and ultrasound-guided injection techniques. J Neurol Sci 2014;347:39-43. Picelli A, Bonetti P, Fontana C, Barausse M, Dambruoso F, Gajofatto F, et al. Accuracy of botulinum toxin type A injection into the gastrocnemius muscle of adults with spastic equinus: Manual needle placement and electrical stimulation guidance compared using ultrasonography. J Rehabil Med. 202;44:450-2. Lee IH, Yoon YC, Sung DH, Kwon JW, Jung JY. Initial experience with imaging-guided intramuscular botulinum toxin injection in patients with idiopathic cervical dystonia. Am J Roentgenol 2009;192:996-1001. Grigoriu AI, Dinomais M, Rémy-Néris O, Brochard S. Impact of injection-guiding techniques on the effectiveness of botulinum toxin for the treatment of focal spasticity and dystonia: A systematic review. Ann PhysRehabil Med 2015;58(Supplement 1):e79. Schnitzler A, Roche N, Denormandie P, Lautridou C, Parratte B, Genet F. Manual needle placement: Accuracy of botulinum toxin A injections. Muscle Nerve 2012;46:531-4. Münchau A, Bhatia KP. Uses of botulinum toxin injection in medicine today. BMJ. 2000;320:161-5. Gil Polo C, Rodríguez Sanz MF, BerrocalIzquierdo N, Castrillo Sanz A, Gutiérrez Ríos R, Zamora García MI, et al. Blepharospasm and hemifacial spasm: Long-term treatment with botulinum toxin. Neurol Barc Spain 2013;28:131-6. Price J, O'Day J. Efficacy and side effects of botulinum toxin treatment for blepharospasm and hemifacial spasm. Aust N Z J Ophthalmol 1994;22:255-60. Jost WH, Kohl A. Botulinum toxin: Evidence-based medicine criteria in blepharospasm and hemifacial spasm. J Neurol 2001;248:I21-4. Jankovic J, Orman J. Botulinum A toxin for cranial-cervical dystonia: A double-blind, placebo-controlled study. Neurology. 1987;37:616-23. Karp BI, Alter K. Botulinum toxin treatment of blepharospasm, orofacial/oromandibular dystonia, and hemifacial spasm. Semin Neurol 2016;36:84-91. Ramirez-Castaneda J, Jankovic J. Long-term efficacy, safety, and side effect profile of botulinum toxin in dystonia: A 20-year follow-up. Toxicon 2014;90:344-8. Kollewe K, Mohammadi B, Köhler S, Pickenbrock H, Dengler R, Dressler D. Blepharospasm: Long-term treatment with either Botox®, Xeomin® or Dysport®. J Neural Transm (Vienna) 2015;122:427-31. Fernandez HH, Jankovic J, Holds JB, Lin D, Burns J, Verma A, et al. Observational study of incobotulinumtoxina for cervical dystonia or blepharospasm (XCiDaBLE): Interim results for the first 170 subjects with blepharospasm. Tremor Hyperkinetic Mov (N Y) 2014;16;4:238. Gill HS, Kraft SP. Long-term efficacy of botulinum a toxin for blepharospasm and hemifacial spasm. Can J Neurol Sci. 2010;37:631-6. Tan EK, Jankovic J. Bilateral hemifacial spasm: A report of five cases and a literature review. Mov Disord 1999;14:345-9. Felício AC, Godeiro-Junior Cde O, Borges V, Silva SM, Ferraz HB. Bilateral hemifacial spasm: A series of 10 patients with literature review. Parkinsonism Relat Disord 2008;14:154-6. Yoshimura DM, Aminoff MJ, Tami TA, Scott AB. Treatment of hemifacial spasm with botulinum toxin. Muscle Nerve 1992;15:1045-9. Sorgun MH, Yilmaz R, Akin YA, Mercan FN, Akbostanci MC. Botulinum toxin injections for the treatment of hemifacial spasm over 16 years. J Clin Neurosci. 2015;22:1319-25. Rudzińska M, Wójcik M, Szczudlik A. Hemifacial spasm non-motor and motor-related symptoms and their response to botulinum toxin therapy. J Neural Transm (Vienna). 2010;117:765-72. Xiao L, Pan Y, Zhang X, Hu Y, Cai L, Nie Z, et al. Facial asymmetry in patients with hemifacial spasm before and after botulinum toxin A treatment. Neurol Sci 2016;37:1807-13. Prutthipongsit A, Aui-aree N. The difference of treatment results between botulinum toxin A split injection sites and botulinum toxin A non-split injection sites for hemifacial spasm. J Med Assoc Thail 2015;98:1119-23. Chan J, Brin MF, Fahn S. Idiopathic cervical dystonia: Clinical characteristics. Mov Disord 1991;6:119-26. Pandey S, Singh AS. The double-chin posture: Posterior sagittal shift in cervical dystonia. Neurol India 2016;64:556-8. Anderson TJ, Rivest J, Stell R, Steiger MJ, Cohen H, Thompson PD, et al. Botulinum toxin treatment of spasmodic torticollis. J R Soc Med 1992;85:524-9. Walker FO. Botulinum toxin therapy for cervical dystonia. Phys Med Rehabil Clin N Am 2003;14:749-766. Zoons E, Dijkgraaf MGW, Dijk JM, van Schaik IN, Tijssen MA. Botulinum toxin as treatment for focal dystonia: A systematic review of the pharmaco-therapeutic and pharmaco-economic value. J Neurol 2012;259:2519-26. Chapman MA, Barron R, Tanis DC, Gill CE, Charles PD. Comparison of botulinum neurotoxin preparations for the treatment of cervical dystonia. Clin Ther 2007;29:1325-37. Bihari K. Safety, effectiveness, and duration of effect of BOTOX after switching from Dysport for blepharospasm, cervical dystonia, and hemifacial spasm dystonia, and hemifacial spasm. Curr Med Res Opin 2005;21:433-8. Jinnah HA, Comella CL, Perlmutter J, Lungu C, Hallett M, Dystonia Coalition Investigators. Longitudinal studies of botulinum toxin in cervical dystonia: Why do patients discontinue therapy? Toxicon 2017 Sep 6; doi: 10.1016/j.toxicon.2017.09.004. Truong DD, Jost WH. Botulinum toxin: Clinical use. Parkinsonism Relat Disord. 2006;12:331-55. Pandey S, Sharma S. Meige's syndrome: History, epidemiology, clinical features, pathogenesis and treatment. J Neurol Sci 2017;372:162-70. Papapetropoulos S, Singer C. Botulinum toxin in movement disorders. Semin Neurol 2007;27:183-94. Tan E, Jankovic J. Tardive and idiopathic oromandibular dystonia: A clinical comparison. J Neurol Neurosurg Psychiatry 2000;68:186-90. Norby E, Orbelo D, Strand E, Duffy J, E kbom D Bower J, et al. Hyoid muscle dystonia: A distinct focal dystonia syndrome. Parkinsonism Relat Disord 2015;21:1210-3. Papapetropoulos S, Singer C. Primary focal lingual dystonia. Mov Disord. 2006;21:429-30. Jankovic J, Beach J. Long-term effects of tetrabenazine in hyperkinetic movement disorders. Neurology 1997;48:358-62. Blitzer A, Brin MF, Greene PE, Fahn S. Botulinum toxin injection for the treatment of oromandibular dystonia. Ann OtolRhinolLaryngol 1989;98:93-7. Brin MF, Fahn S, Moskowitz C, Friedman A, Shale HM, Greene PE, et al. Localized injections of botulinum toxin for the treatment of focal dystonia and hemifacial spasm. MovDisord 1987;2:237-54. Hermanowicz N, Truong DD. Treatment of oromandibular dystonia with botulinum toxin. The Laryngoscope 1991;101:1216-8. Jankovic J, Schwartz K, Donovan DT. Botulinum toxin treatment of cranial-cervical dystonia, spasmodic dysphonia, other focal dystonias and hemifacial spasm. J Neurol Neurosurg Psychiatry. 1990;53:633-9. Laskawi R, Rohrbach S. Oromandibular dystonia. Clinical forms, diagnosis and examples of therapy with botulinum toxin. Laryngorhinootologie 2001;80:708-13. Van den Bergh P, Francart J, Mourin S, Kollmann P, Laterre EC. Five-year experience in the treatment of focal movement disorders with low-dose Dysportbotulinum toxin. Muscle Nerve 1995;18:720-9. Wan X, Vuong KD, Jankovic J. Clinical application of botulinum toxin type B in movement disorders and autonomic symptoms. Chin Med Sci J 2005;20:44-7. Tan EK, Jankovic J. Treating severe bruxism with botulinum toxin. J Am Dent Assoc 2000;131:211-6. Jankovic J. An update on new and unique uses of botulinum toxin in movement disorders. Toxicon 2017 Sep 6; doi: 10.1016/j.toxicon.2017.09.003. Esper CD, Freeman A, Factor SA. Lingual protrusion dystonia: Frequency, etiology and botulinum toxin therapy. Parkinsonism Relat Disord 2010;16:438-41. Hennings JMH, Krause E, Bötzel K, Wetter TC. Successful treatment of tardive lingual dystonia with botulinum toxin: Case report and review of the literature. Prog Neuropsychopharmacol Biol Psychiatry 2008;32:1167-71. Lungu C, Ahmad OF. Update on the use of botulinum toxin therapy for focal and task-specific dystonias. Semin Neurol 2016;36:41-6. Sheehy MP, Marsden CD. Writers' cramp-a focal dystonia. Brain J Neurol 1982;105(Pt 3):461-80. Pandey S. A practical approach to management of focal hand dystonia. Ann Indian Acad Neurol 2015;18:146-53. Zeuner KE, Knutzen A, Pedack L, Hallett M, Deuschl G, Volkmann J. Botulinum neurotoxin treatment improves force regulation in writer's cramp. Parkinsonism Relat Disord 2013;19:611-6. Cohen LG, Hallett M, Geller BD, Hochberg F. Treatment of focal dystonias of the hand with botulinum toxin injections. J Neurol Neurosurg Psychiatry 1989;52:355-63. Behari M. Botulinum toxin in the treatment of writer's cramp. J Assoc Physicians India 1999;47:694-8. Kruisdijk JJM, Koelman JHTM, de Visser BWO, de Haan RJ, Speelman JD. Botulinum toxin for writer's cramp: A randomised, placebo-controlled trial and 1-year follow-up. J Neurol Neurosurg Psychiatry 2007;78:264-70. Karp BI, Cole RA, Cohen LG, Grill S, Lou JS, Hallett M. Long-term botulinum toxin treatment of focal hand dystonia. Neurology 1994;44:70-6. Jedynak PC, Tranchant C, de Beyl DZ. Prospective clinical study of writer's cramp. Mov Disord 2001;16:494-9. Goldman JG. Writer's cramp. Toxicon 2015;107:98-104. Jinnah HA, Berardelli A, Comella C, Defazio G, Delong MR, Factor S, et al. The focal dystonias: Current views and challenges for future research. Mov Disord 2013;28:926-43. Wissel J, Kabus C, Wenzel R, Klepsch S, Schwarz U, Nebe A, et al. Botulinum toxin in writer's cramp: Objective response evaluation in 31 patients. J Neurol Neurosurg Psychiatry 1996;61:172-5. Sharma S, Pandey S. Approach to a tremor patient. Ann Indian Acad Neurol 2016;19:433-43. Hsu Y-D. Tremor. Acta Neurol Taiwan 2010;19:62-9. Jankovic J, Schwartz K. Botulinum toxin treatment of tremors. Neurology 1991;41:1185-8. Henderson JM, Ghika JA, Van Melle G, Haller E, Einstein R. Botulinum toxin A in non-dystonic tremors. Eur Neurol 1996;36:29-35. Rostami R, Chow C, Richardson D, Jabbari B, Machado D. Botulinum toxin treatment of essential tremor - A customized approach. AAN-2016 2016; abstr. S27.002. Available from: URL: http://www.abstractsonline.com/pp8/#!/4046/ presentation/6431. [Last accessed ob 2018 Feb 18]. Rahimi F, Samotus O, Lee J, Jog M. Effective management of upper limb parkinsonian tremor by incobotulinumtoxina injections using sensor-based biomechanical patterns. Tremor Hyperkinetic Mov (N Y). 2015;5:348. Trosch RM, Pullman SL. Botulinum toxin A injections for the treatment of hand tremors. MovDisord 1994;9:601-9. Mittal SO, Machado D, Richardson D, Dubey D, Jabbari B. Botulinum toxin in parkinson disease tremor: A randomized, double-blind, placebo-controlled study with a customized injection approach. Mayo Clin Proc 2017;92:1359-67. Ludlow CL, Sedory SE, Fujita M, Naunton RF. Treatment of voice tremor with botulinum toxin injection. Neurology 1989;39(suppl 1) 353. Brin MF, Blitzer A, Stewart C, Viswanath N, Beardsley A, Rosenfield D, et al. Laryngeal botulinum toxin (botox) injections in 431 patients with laryngeal movement disorders: Spasmodic dysphonia, adult stuttering and essential voice tremor. MovDisord 1992;7(suppl 1) 130. Warrick P, Dromey C, Irish JC, Durkin L, Pakiam A, Lang A, Botulinum toxin for essential tremor of the voice with multiple anatomical sites of tremor: A crossover design study of unilateral versus bilateral injection. Laryngoscope2000;1101366-74. Warrick P, Dromey C, Irish J, Durkin L. The treatment of essential voice tremor with botulinum toxin A: A longitudinal case report. J Voice 2000;14:410- 421. Adler CH, Bansberg SF, Hentz JG, Ramig LO, Buder EH, Witt K, et al. Botulinum Toxin Type A for Treating Voice Tremor. Arch Neurol 2004;61:1416-20. Hallett M, Albanese A, Dressler D, Segal KR, Simpson DM, Truong D, et al. Evidence-based review and assessment of botulinum neurotoxin for the treatment of movement disorders. Toxicon 2013;67:94-114. Sheffield JK, Jankovic J. Botulinum toxin in the treatment of tremors, dystonias, sialorrhea and other symptoms associated with Parkinson's disease. Expert Rev Neurother 2007;7:637-47. Simpson DM, Hallett M, Ashman EJ, Comella CL, Green MW, Gronseth GS, et al. Practice guideline update summary: Botulinum neurotoxin for the treatment of blepharospasm, cervical dystonia, adult spasticity, and headache: Report of the Guideline Development Subcommittee of the American Academy of Neurology. Neurology 2016;86:1818-26. Mills R, Bahroo L, Pagan F. An update on the use of botulinum toxin therapy in Parkinson's disease. Curr Neurol Neurosci Rep 2015;15:511. Krack P, Marion MH. “Apraxia of lid opening,” a focal eyelid dystonia: Clinical study of 32 patients. Mov Disord Off J Mov Disord Soc 1994;9:610-5. Tolosa E, Compta Y. Dystonia in Parkinson's disease. J Neurol 2006;253 Suppl 7:VII7-13. Pacchetti C, Albani G, Martignoni E, Godi L, Alfonsi E, Nappi G. “Off” painful dystonia in Parkinson's disease treated with botulinum toxin. Mov Disord 1995;10:333-6. 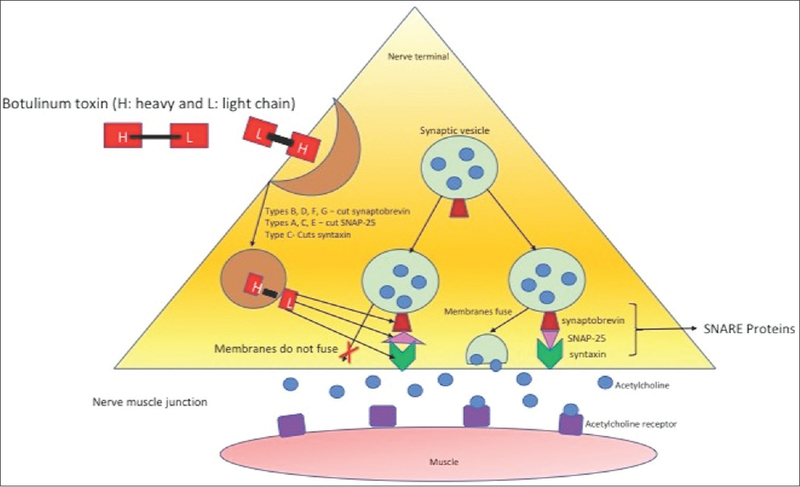 Srivanitchapoom P, Pandey S, Hallett M. Drooling in Parkinson's Disease: A review. Parkinsonism and Related Disorders 2014;20:1109-1118. Kalf JG, Smit AM, Bloem BR, Zwarts MJ, Mulleners WM, Munneke M. Botulinum toxin A for drooling in Parkinson's disease: A pilot study to compare submandibular to parotid gland injections. Parkinsonism Relat Disord 2007;13:532-4. Nóbrega AC, Rodrigues B, Torres AC, Scarpel RD, Neves CA, Melo A. Is drooling secondary to a swallowing disorder in patients with Parkinson's disease? Parkinsonism Relat Disord 2008;14:243-5. Dogu O, Apaydin D, Sevim S, Talas DU, Aral M. Ultrasound-guided versus “blind” intraparotid injections of botulinum toxin-A for the treatment of sialorrhoea in patients with Parkinson's disease. Clin Neurol Neurosurg 2004;106:93-6. Guidubaldi A, Fasano A, Ialongo T, Piano C, Pompili M, Mascianà R, et al. Botulinum toxin A versus B in sialorrhea: A prospective, randomized, double-blind, crossover pilot study in patients with amyotrophic lateral sclerosis or Parkinson's disease. Mov Disord 2011;26:313-9. Jost WH. Treatment of drooling in Parkinson's disease with botulinum toxin. Mov Disord 1999;14:1057. Pal PK, Calne DB, Calne S, Tsui JK. Botulinum toxin A as treatment for drooling saliva in PD. Neurology 2000;54:244-7. Friedman A, Potulska A. Quantitative assessment of parkinsonian sialorrhea and results of treatment with botulinum toxin. Parkinsonism Relat Disord 2001;7:329-32. Lagalla G, Millevolte M, Capecci M, Provinciali L, Ceravolo MG. Botulinum toxin type A for drooling in Parkinson's disease: A double-blind, randomized, placebo-controlled study. Mov Disord 2006;21:704-7. Lagalla G, Millevolte M, Capecci M, Provinciali L, Ceravolo MG. Long-lasting benefits of botulinum toxin type B in Parkinson's disease-related drooling. J Neurol 2009;256:563-7. Lipp A, Trottenberg T, Schink T, Kupsch A, Arnold G. A randomized trial of botulinum toxin A for treatment of drooling. Neurology 2003;61:1279-81. Mancini F, Zangaglia R, Cristina S, Sommaruga MG, Martignoni E, Nappi G, et al. Double-blind, placebo-controlled study to evaluate the efficacy and safety of botulinumtoxin type A in the treatment of drooling in parkinsonism. Mov Disord 2003;18:685-8. Racette BA, Good L, Sagitto S, Perlmutter JS. Botulinum toxin B reduces sialorrhea in parkinsonism. Mov Disord 2003;18:1059-61. Contarino MF, Pompili M, Tittoto P, Vanacore N, Sabatelli M, Cedrone A, et al. Botulinum toxin B ultrasound-guided injections for sialorrhea in amyotrophic lateral sclerosis and Parkinson's disease. Parkinsonism Relat Disord 2007;13:299-303. Ondo WG, Hunter C, Moore W. A double-blind placebo-controlled trial of botulinum toxin B for sialorrhea in Parkinson's disease. Neurology 2004;62:37-40. Chinnapongse R, Gullo K, Nemeth P, Zhang Y, Griggs L. Safety and efficacy of botulinum toxin type B for treatment of sialorrhea in Parkinson's disease: A prospective double-blind trial. Mov Disord 2012;27:219-26. Swinn L, Schrag A, Viswanathan R, Bloem BR, Lees A, Quinn N. Sweating dysfunction in Parkinson's disease. Mov Disord 2003;18:1459-63. Srivanitchapoom P, Hallett M. Camptocormia in Parkinson's disease: Definition, epidemiology, pathogenesis and treatment modalities. J Neurol Neurosurg Psychiatry 2016;87:75-85. Azher SN, Jankovic J. Camptocormia: Pathogenesis, classification, and response to therapy. Neurology 2005;65:355-9. Von Coelln R, Raible A, Gasser T, Asmus F. Ultrasound-guided injection of the iliopsoas muscle with botulinum toxin in camptocormia. Mov Disord 2008;23:889-92. Colosimo C, Salvatori FM. Injection of the iliopsoas muscle with botulinum toxin in camptocormia. Mov Disord 2009;24:316-7. Fietzek UM, Schroeteler FE, Ceballos-Baumann AO. Goal attainment after treatment of parkinsonian camptocormia with botulinum toxin. Mov Disord 2009;24:2027-8. Naumann M. Long-term safety of therapeutic botulinum toxin A. Nervenarzt 2008;79 Suppl 1:41-3. Marvulli R, Mastromauro L, Falcicchio ML, Gallo GA, Napolitano M, et al. Botulinum toxin type a and physiokinesiterapy in the treatment of Pisa syndrome. J Alzheimers Dis Parkinsonism 2017;7:354. Santamato A, Ranieri M, Panza F, Zoccolella S, Frisardi V, Solfrizzi V, et al. Botulinum toxin type A and a rehabilitation program in the treatment of Pisa syndrome in Parkinson's disease. J Neurol 2010;257:139-41. Bloem BR, Hausdorff JM, Visser JE, Giladi N. Falls and freezing of gait in Parkinson's disease: A review of two interconnected, episodic phenomena. Mov Disord 2004;19:871-84. Wieler M, Camicioli R, Jones CA, Martin WRW. Botulinum toxin injections do not improve freezing of gait in Parkinson disease. Neurology 2005;65:626-8. Fernandez HH, Lannon MC, Trieschmann ME, Friedman JH. Botulinum toxin type B for gait freezing in Parkinson's disease. Med Sci Monit 2004;10:CR282-4. Giladi N. Medical treatment of freezing of gait. Mov Disord 2008;23 Suppl 2:S482-488. Gurevich T, Peretz C, Moore O, Weizmann N, Giladi N. The effect of injecting botulinum toxin type a into the calf muscles on freezing of gait in Parkinson's disease: A double blind placebo-controlled pilot study. Mov Disord 2007;22:880-3. Jankovic J, Schwartz K, Clemence W, Aswad A, Mordaunt J. A randomized, double-blind, placebo-controlled study to evaluate botulinum toxin type A in essential hand tremor. Mov Disord 1996;11:250-6. Brin MF, Lyons KE, Doucette J, Adler CH, Caviness JN, Comella CL, et al. A randomized, double masked, controlled trial of botulinum toxin type A in essential hand tremor. Neurology 2001;56:1523-8. Schneider SA, Edwards MJ, Cordivari C, Macleod WN, Bhatia KP. Botulinum toxin A may be efficacious as treatment for jaw tremor in Parkinson's disease. Mov Disord 2006;21:1722-4. Giannantoni A, Rossi A, Mearini E, Del Zingaro M, Porena M, Berardelli A. Botulinum toxin A for overactive bladder and detrusor muscle overactivity in patients with Parkinson's disease and multiple system atrophy. J Urol 2009;182:1453-7. Giannantoni A, Conte A, Proietti S, Giovannozzi S, Rossi A, Fabbrini G, et al. Botulinum toxin type A in patients with Parkinson's disease and refractory overactive bladder. J Urol 201;186:960-4. Kulaksizoglu H, Parman Y. Use of botulinum toxin-A for the treatment of overactive bladder symptoms in patients with Parkinsons's disease. Parkinsonism Relat Disord 2010;16:531-4. Anderson RU, Orenberg EK, Glowe P. OnabotulinumtoxinA office treatment for neurogenic bladder incontinence in Parkinson's disease. Urology 2014;83:22-7. Cadeddu F, Bentivoglio AR, Brandara F, Marniga G, Brisinda G, Maria G. Outlet type constipation in Parkinson's disease: Results of botulinum toxin treatment. Aliment Pharmacol Ther 2005;22:997-1003. Maria G, Cadeddu F, Brandara F, Marniga G, Brisinda G. Experience with type A botulinum toxin for treatment of outlet-type constipation. Am J Gastroenterol 2006;101:2570-5. Bruno VA, Fox SH, Mancini D, Miyasaki JM. Botulinum toxin use in refractory pain and other symptoms in Parkinsonism. Can J Neurol Sci 2016;43:697-702. Marras C, Andrews D, Sime E, Lang AE. Botulinum toxin for simple motor tics: A randomized, double-blind, controlled clinical trial. Neurology 2001;56:605-10. Kwak CH, Hanna PA, Jankovic J. Botulinum toxin in the treatment of tics. Arch Neurol 2000;57:1190-3. Porta M, Maggioni G, Ottaviani F, Schindler A. Treatment of phonic tics inpatients with Tourette's syndrome using botulinum toxin type A. Neurol Sci 2004;24:420-3. Aguirregomozcorta M, Pagonabarraga J, Diaz-Manera J, Pascual-Sedano B, Gironell A, Kulisevsky J. Efficacy of botulinum toxin in severe Tourette syndrome with dystonic tics involving the neck. Parkinsonism Relat Disord. 2008;14:443-5.